It’s easy for listeners to forget, but a jazz vocalist ignores this basic fact at his or her own peril: the voice is an instrument. A whole lot of contemporary singers don’t realize that they are band members. Those singers want to be the center of attention. Their vocal acrobatics limit the creativity of their fellow musicians, turning what is supposed to be a musical democracy into a cult of personality dominated by the singer. Of course, there are some legendary jazz singers who were loved by the men and women playing those pianos, drums, trumpets and other instruments that had to be purchased – Ella Fitzgerald, Billie Holiday and Johnny Hartman come to mind. Musicians loved Ella because she understood that she was a member of the band, and she was up to the task of being as creative with her voice as the other musicians were with their instruments. 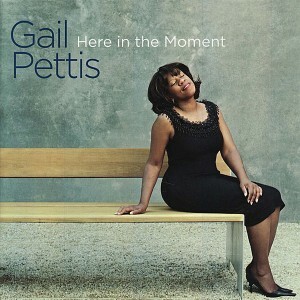 Gail Pettis approaches jazz singing with the sensibility of an instrumentalist on 2007’s May I Come In and on the upcoming Here in the Moment. Jazz musicians hear a tune – I love how they call songs tunes – and they think about how they rearrange it melodically, as well as seeing how far they can go in creating solos that deviate from the melody and still return seamlessly to that melody. Being part of the most democratic of musical forms, jazz musicians manage to do this while also engaging in an instrumental conversation with the other members of the ensemble. The effective jazz vocalist also understands that a song’s melody is a canvas, and that theirs is but one hand creating the musical picture. The musical picture can be representational, but it will also include more than a little abstract expressionism. A jazz vocalist has to have equal parts Degas and Pollock and have the ability to switch from one form to another, all within the course of one song. Pettis once again proves that she is an adept musical artist. She can sing bluesy numbers such as “Snap Your Fingers,” and proves she can tell a jazzy story, ala Nancy Wilson, on the torchy ballad “How Did He Look.” Her work on rearranged tunes such as “The Very Thought of You,” “At Last,” “I Could Have Danced All Night,” the Latin tinged “Nature Boy” and “I Thought About You” shows that Pettis is up to the challenge of pouring new wine into old wineskins. And lets face it, if singers are going to continue returning to these classics, they need to be able to do something new with them lest they grow stale. Finally and most importantly, Pettis knows when to relinquish the stage to her fellow musicians and let them create. She is more than generous in the space she gave her fellow musicians, and they respond with inspired work. Musicians matter on jazz records, so I’m sure Pettis won’t mind if I give them a shout out: Darin Clendenin and Randy Halberstadt both manned the pianist bench, Clipper Anderson and Jeff Johnson played the bass and Mark Ivester served as drummer and percussionist. And also give it up to Gail Pettis, the singer who plays her voice like a master. Recommended.